‘There are comparatively few women prisoners in Brisbane. 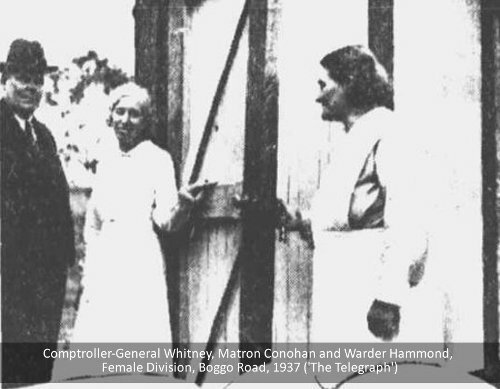 On one occasion when the Comptroller-General (Mr. J. F. Whitney) went south he was able to say that there was only one woman prisoner in the whole of Queensland. Yet once they have set foot on the downward path women rarely reform. Their record in this direction is not nearly so encouraging as that of the male delinquent. Accompanied by a Press photographer, a representative of ‘The Telegraph’ set out to view, by courtesy of Mr. Whitney, that portion of the Brisbane Gaol reserved for women prisoners. As the car moved up the broad drive to the main entrance, past plots of flowers and frangipani trees, memories of the old convict prisons with their ‘dumb’ cells, &c. - the only gaols which Press representatives had hitherto inspected - vanished like dark dreams of the past. Here was a place of locked doors and patrolled walls, where one parleyed through a peep-hole with a man in uniform before being granted permission to enter. But a place of humane conception where the floors were spotless, where an alert discipline and an air of briskness prevailed. There was very little difference between the offices of the comptroller and his staff and those of any ordinary government department save that the former were equipped with a fine wireless set by means of which the inmates of the gaol are treated each evening to an hour's programme. Accompanied by Mr. Whitney, the Press representatives made a detour beyond the formidable brick walls with their posted sentries to that corner of the grounds where stands the gaol, reserved for women. Galvanised iron, fourteen feet high and topped by sharp points, encloses it. Save that the windows are barred, however, the verandahs latticed in, and at the girdle of the matron hangs a shining bundle of keys, the women's gaol, despite the fact that it could scarcely be termed a 1937 structure, pleasantly surprises the visitor. Everything is so bright and shining. The verandahs are wide and cool, the wards airy and spotless. Through the lattice the initiates, if they so desire, can catch a glimpse not only of the gaol grounds but of the roofs of the city whose laws they have transgressed. The exterior of the building is painted brown and mastic, picked out in white and, since those in charge evidently believe in the psychology of colour, the wards themselves are a light cheerful blue. In them stand the cots or small iron bedsteads with their blankets, pillows and white coverlets piped with scarlet. There are two wards. The larger has a well-scrubbed table in the centre, set with forms, where the prisoners take their meals. The smaller, known as ‘church,’ serves a dual purpose, for it is here on Sundays that service is conducted. A white cupboard is utilised for an altar. There are texts on the walls and two fine sepia prints of our Lord, the last the' gift of the late Countess of Dudley, the wife of a former Governor General. A small harmonium completes the furnishings. Cheerful as a prisoner's cell sounds somewhat incongruous, but the cells which open off the smaller ward, with their light blue walls, their cots and tables, are the reverse to depressing, despite their locked doors and high barred ventilators. The matron's office, where a grey rug made from scraps of material and backed with sacking - the work of one of the prisoners - is exhibited, a room for the night officer, a bath, wash room, &c., are all included in the gaol, which is lit electrically. There is laundry accommodation with fitted tubs and boiler and a kitchen with a double range. Matron R. Conohan, who has been at the gaol eleven years, is assisted by a staff consisting of four female warders. At the time of ‘The Telegraph's’ inspection the whirr of machines sounded from the southern verandah, where the prisoners were sewing. The latter make not only their own clothes, but garments for the State Stores as well. They also do their own cooking, scrubbing and laundry work. Each prisoner is clothed in a striped cotton uniform, a white apron and cap-like head-dress, and white slippers and stockings. The day begins early in the prison. The women are up at 6 a.m., with the wards tidied and blankets folded for the let go at 6.30. Breakfast is at 7. From 10 past 8 to 10 past 12 tasks are allotted. Then comes dinner, and work from 10 past 1 to 4 p.m. Tea is at 4.30. The food includes maize, oatmeal or rice, roast or boiled meat, stew or potato pie. Potatoes, green vegetables, and tea form other items, while each prisoner is allowed a pint of milk per day. Books are not debarred, and each night there is an hour's broadcast. Lights are out by 8 p.m.